Sometimes you need a little change. You've done the basic rib at least a zillion times. So let's shake things up. This rib travels on the diagonal and is as easy as the basic rib. It has a lovely heavy texture that dresses up any beanie with ease. This pattern is part of my ongoing series for the American Heart Association project Little Hats Big Hearts. Make one for the newest member of your family and then make one to donate. 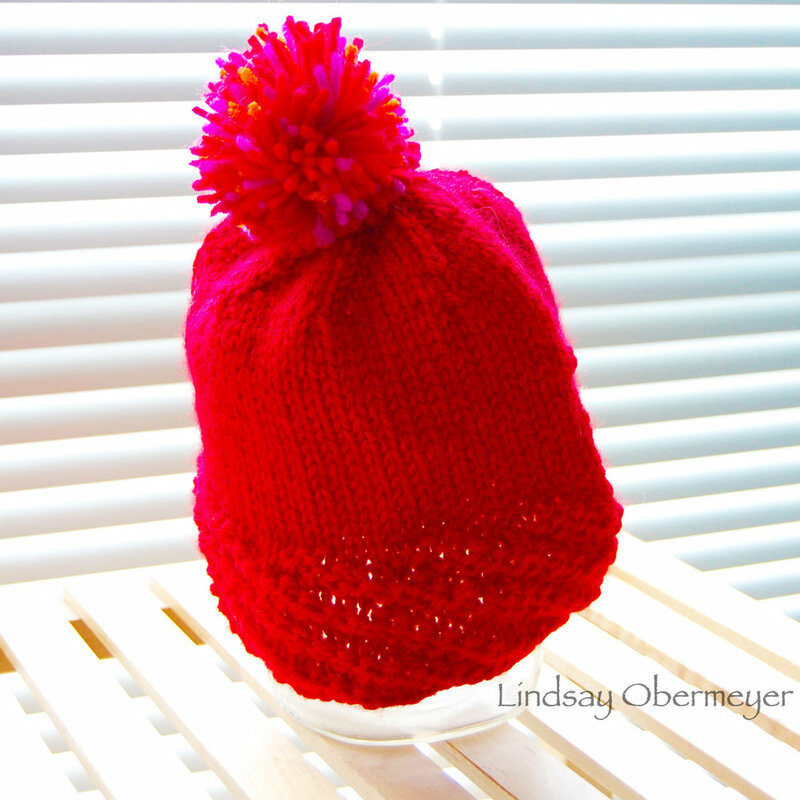 I used Red Heart Soft in Cherry Red and a variegated for the PomPom. This one was designed for a baby at 16" in diameter. Stitches: 3x3 Diagonal Rib in the round. Round 1: *P3, K3,* Rep from * to *. End with a 1K stitch past the stitch marker. Round 2: *P3, k3,* Rep from * to *. End with 2K stitches past the stitch marker. Round 3: *P3, k3,* Rep from * to *. End with 3K stitches past the stitch marker. Repeat Rounds 1-3 for desired length. This creates a diagonal shifting of the rib. This rib will add some lovely texture at the brim. Place a stitch marker. Join circle. Start knitting the 3x3 Rib. Continue in this pattern for 2 inches ending with round 3. Switch to Stockinette. Work in Stockinette (which in the round is just knitting) for 2.5 inches. When you have knit 4.5 inches from the beginning, K2Tog before the stitch marker, for a total of 64 stitches. Place a stitch marker after every 8 stitches. Round 1 Decreases: K2Tog before every stitch marker. Repeat this round sequence (5 and 6) until only 8 stitches remain. Switch to double point needles when necessary. Cut yarn leaving a 6 " tail. Thread tapestry needle an run the tail through the final 8 stitches. Draw it closed. Weave in all tails. Make a PomPom and sew it to the top of the beanie. If you are looking for this pattern in other sizes, click here.